Khonzanani Nqobizitha Mlambo began planning his mission to help improve lives in Africa when he was a teenager living with his family in Zimbabwe. He kept his dream alive, and decided to study MSci Pharmaceutical Science at Huddersfield University in 2005. He graduated in July 2009, completing his degree, including a one year work experience with GlaxoSmithKline in Dartford, Kent. His first job after graduating was in November 2009 as a Formulation assistant at a Company called Reckitt Benckiser in Hull. He initially worked in a Research & Development Department, which formulates a sublingual drug called Buprenorphine. In September 2010, he progressed to the Strepsils Department as a formulation assistant up to 2012. In 2013 he joined a company called DePuy Synthes Companies of Johnson & Johnson as a Formulation Scientist in a Research & Development Department. These are American multinational companies that offer the world’s most comprehensive portfolio of orthopedic products and services for joint reconstruction, trauma, spine, sports medicine and cranio-maxillofacial therapies. In 2014 he joined a Pharma company called NuPharm Laboratories in North West of England near Chester. He worked as a Formulation Development Scientist, he specialized in different types of dosage formulations. In 2015 – 2017, he joined a Pharma company called IPS Specials as a Formulation Development Scientist, based in Surrey. IPS Specials is one of the leading manufacturers of Unlicensed Medicines in the UK with over 20,000 Pharmaceutical formulations available to Primary and Secondary Care. 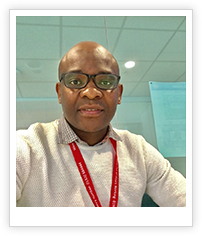 He is currently working for GlaxoSmithKline as an R&D Formulation Scientist, in the Drug Product Design & Development Department, based in Ware – Hertfordshire. GSK has three global businesses that research, develop and manufacture innovative pharmaceutical medicines, vaccines and consumer healthcare products. He is one of the core founders of Evergreen Partnership Association. The group started as friends at Huddersfield University before collaborating with other individuals to begin to forge a formidable organization focused on helping to improve lives in local communities of United Kingdom, and developing regions around the world. His Plans are to help provide affordable medication to the world’s poorest regions. He is a people person & has a strong belief in the duty to contribute to the community welfare.